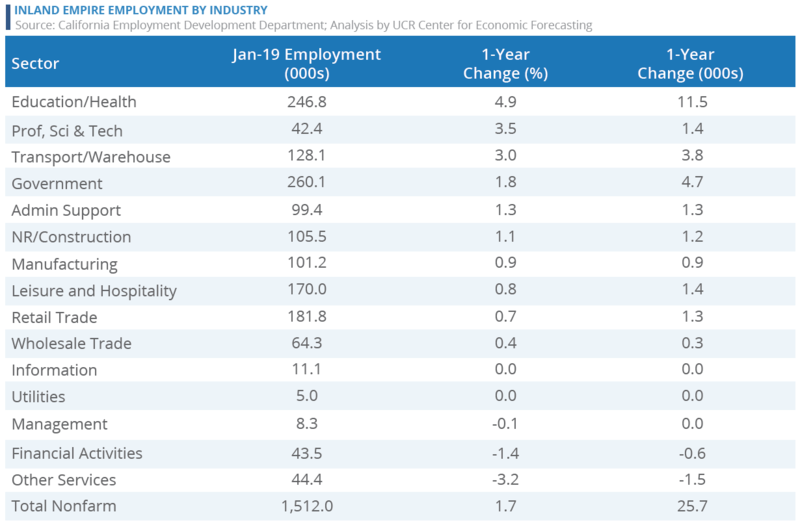 The Inland Empire began 2019 where it left off last year, outpacing the rest of Southern California in job gains. The increases were led by Health Care, Government, and Transportation and Warehousing. Job growth resulted in an unemployment rate within range of its record low despite recent increases in the region’s labor force. Wage growth over the past year fueled activity in many sectors, reflected in recent impressive increases in taxable sales. With interest rates retreating from their highs in late 2018, there is potential for housing to perform better than expected in the forthcoming peak season. 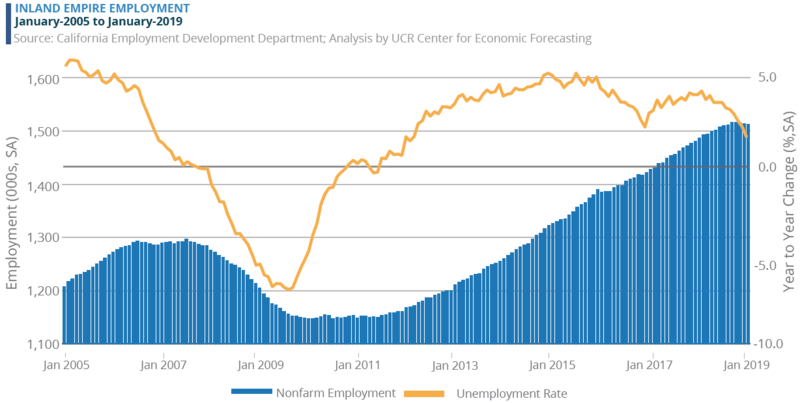 The latest numbers from California’s Employment Development Department (EDD) indicate that the economic expansion in the Inland Empire is continuing at a healthy clip, albeit at a slower pace compared with recent years. From January 2018 to January 2019 the region added 25,700 nonfarm jobs, a 1.7% year-over-year increase. This pace outshines the State’s more moderate 1.4% gain but trails the 1.9% gains in the nation over the period. With the release of January employment figures, the EDD also provided its annual benchmark revision. Throughout the year, employment-by-industry data are estimated from sample figures. On an annual basis, when updated information becomes available from detailed tax records, the employment-by-industry estimates are revised, providing a more accurate picture. The additional data showed annual growth in the Inland Empire averaged a solid 3.1% in 2018 over 2017, although it was lower than the original estimate of 3.5%. Wages in the Inland Empire are also increasing, although at a modest rate. Overall earnings in the region grew 2.8% from the first three quarters of 2017 to the first three quarters of 2018, with wages increasing 2.7% in Riverside County and 2.8% in San Bernardino County. Over the same period, wages in the State overall grew 4.3%. Continued upward pressure on wages is anticipated as labor markets tighten throughout Southern California. The Inland Empire’s affordability advantage has helped the region sustain gains in its labor force. From January 2018 to January 2019, the Inland Empire’s labor force expanded 2.3%, growing by roughly 46,000, outpacing both Los Angeles (0.7%) and Orange (1.7%) counties. In contrast, the labor force in California expanded 1.5% over the period. Labor force gains have eclipsed gains in household employment, which pushed the unemployment rate up to 4.5%, which is in line with the rate a year earlier but above the historic lows of recent months. At the industry level, job growth has been broad-based, with most Inland Empire sectors expanding payrolls over the last year. Health Care and Education has provided the largest number of new jobs; payrolls grew by 11,500 (4.9%) positions from January 2018 to January 2019. The Government sector was second, adding 4,700 (1.8%) jobs over the year. Most of the new Government positions came from Local Government (3,000), with Local Government Education (1,900) driving much of the growth. The Transportation and Warehousing sector also continued to provide a significant number of new jobs, with payrolls growing by 3,800 (3.0%) positions. This was followed by Professional, Scientific and Technical Services, which added 1,400 (3.5%) positions, and Administrative Support, which added 1,300 (1.3%) positions. A few sectors in the Inland Empire lost positions over the last year. Losses were most prominent in the Other Services sector, which shed 1,500 (-3.2%) jobs over the last year. Jobs in this sector include equipment and machinery repairing, dry cleaning and laundry services, and personal care services. Financial Activities was the only other major sector to lose positions over the last year, with payrolls declining by 600 (-1.4%). An uptick in construction spending and sustained gains in job counts have spurred local spending. Taxable sales in the Inland Empire increased 7.3% in 2018 over 2017. Riverside County’s overall taxable sales increased 8.7% during this period, and within the County, the cities of Corona (4.8%) and Riverside (3.0%) had considerable gains, while taxable sales grew modestly in Moreno Valley (1.0%). In San Bernardino County, taxable sales increased 6.1%, and within the County, Fontana (5.0%), Rancho Cucamonga (3.4%) and San Bernardino (5.8%) led the way. With solid growth in taxable sales, consumer and business spending in Riverside County (8.7%) and San Bernardino County (6.1%) outpaced the State overall (5.2%) compared with 2017 levels. Every spending category in the Inland Empire grew in 2018. Fuel and Services Stations led the way, with a 6.6% increase from the fourth quarter of 2017 to the fourth quarter of 2018. Rising fuel prices were primarily responsible for the gain, a trend that will probably be tempered by the recent sharp decrease in prices. Consumer spending at Food and Drug stores increased 3.8%, followed by Restaurants and Hotels, where spending increased 3.0% over the period. It was a good year for Hospitality and Tourism. Following the gains in Leisure and Hospitality employment and Restaurant and Hotel spending, occupancy rates at local hotels averaged 78.7% in 2018, holding steady relative to 2017. The average daily rate for local hotels grew to $124.50 in 2018, a 3.4% increase over 2017 levels. All told, revenue per available unit grew 3.5%. Passenger traffic at Ontario International Airport continued to expand. 2017’s passenger growth was the best since 2010, and 2018 was even better. A total of 5.12 million passengers passed through the airport in 2018, a 12.4% increase over 2017 and the highest since 2008. The uptick in construction activity throughout the Inland Empire and other parts of Southern California boosted sales tax receipts 6.6% in the Building and Construction category from the fourth quarter of 2017 to the fourth quarter of 2018. The increase indicates that developers are using local suppliers for projects and, more important, are building desperately needed housing stock, which will be critical for continued economic vitality in the region. Business-to-business spending also grew over the last year in the Inland Empire, with Business and Industry sales tax receipts increasing 3.5% from the fourth quarter of 2017 to the fourth quarter of 2018. Total trade through the Ports of Long Beach and Los Angeles reached $408 billion in 2018, a 5.8% increase over 2017 levels, despite concerns about the Trump administration’s current and proposed trade policies. Port activity increased in 2018 partly because the worst-case scenarios did not materialize. Rather than unilaterally pull out of NAFTA as threatened, the United States negotiated a new trade agreement with our two neighbors and largest trading partners that looks almost exactly like the old trade agreement. A brewing trade fight with the European Union that began with steel tariffs has also settled down, and there are now discussions about renewing talks and working toward a new trade agreement. Although the China trade dispute is still brewing, even a major trade war with China would not be enough to end the current economic expansion. The Inland Empire is considered a desirable place to live because of the space and amenities the region offers. It is also one of the last bastions of affordable real estate in Southern California, which has helped to drive continued gains in home prices in the region. The median price of an existing single-family home increased to $357,000 in the fourth quarter of 2018, a 4.5% increase from one year earlier. Year-over-year price gains in the Inland Empire surpassed Los Angeles County (2.3%), Orange County (0.7%), San Diego County (2.3%) and the State as a whole (3.6%). As in much of the State, home sales slowed noticeably in 2018. There were just over 55,200 homes sold in the Inland Empire in 2018, a 6.7% decrease from a year earlier. Affordability remains a strong selling point for real estate in the Inland Empire and should continue to lure would-be buyers to the area. Additional housing stock will be critical in attracting new residents and helping strengthen the Inland Empire’s growing employment base. Roughly 2,133 new homes were sold during the fourth quarter of 2018 on a seasonally adjusted basis, and the median price of a new single-family home was just over $450,000, out of reach for many households in search of the Inland Empire’s balance among amenities, affordability and access to jobs. Thirty-year mortgage rates rose through November of last year, nearly brushing up against the 5% threshold. Although this had a chilling effect on sales everywhere in late 2018, the fixed rate retreated to 4.3% by mid- March. 1 The pullback in rates, along with the recent increase in the supply of homes, may create favorable conditions for the forthcoming peak season. Because homeownership remains out of reach for many Inland Empire residents, significant pressure in the rental market has continued. Although new units pushed up apartment vacancy rates from recent lows, the rate stood at 3.1% in the fourth quarter of 2018, lower than Los Angeles County (3.8%), Orange County (4.0%) and San Diego County (4.0%). At the same time, the average asking rent increased to $1,365 per month, up 4.4% from the fourth quarter of 2017. Renters enjoy significant cost savings compared with the coastal markets, with average asking rents in Los Angeles County ($2,004), Orange County ($1,948) and San Diego County ($1,822) significantly higher. Residential construction activity remains steady in the Inland Empire. There were 13,572 residential units permitted in 2018, a 0.2% decrease over 2017. Residential construction is being driven by single-family units, which increased 4.1% to 10,730 units in 2018. Multifamily slowed relative to last year, with 2,842 permits issued in 2018, a 13.5% decline. Given that population growth in the Inland Empire (1.2%) outpaced that of the State (0.8%), Los Angeles County (0.5%) and Orange County (0.7%) from 2017 to 2018, construction activity must also maintain a steady pace to preserve the region’s affordability and enable growth. As the Inland Empire’s economic expansion continues, the local commercial real estate market is on the rise. New stock continues to come online, vacancy rates are falling, and rents remain affordable relative to Los Angeles and Orange counties. These attributes make the region a prime location for businesses to start up, expand or relocate. The Inland Empire’s expanding Logistics sector is driving demand for warehouse and distribution space. New stock, rather than declining demand, caused the vacancy rate to edge up 2.2 percentage points to 8.5% over the prior year in the fourth quarter of 2018. And the 4.1% gain in asking rents from the fourth quarter of 2017 to the fourth quarter of 2018 reaffirms that demand for warehouse and logistic space remains strong. This pace of growth is the swiftest in Southern California, with Los Angeles (3.6%), Orange (2.2%) and San Diego (3.0%) counties all growing at a more modest pace. Occupied warehouse stock in the region grew 3.2% from the fourth quarter of 2017 to the fourth quarter of 2018, as tenants clamored for warehouse and distribution center space. Research and development industrial space is also in high demand in the Inland Empire. Vacancy rates fell to 5.1% in the fourth quarter of 2018, a 0.2-percentage-point decline from a year earlier. Asking rents are also rising steadily, increasing 2.9% from the fourth quarter of 2017 to the fourth quarter of 2018, to an annual rate of $8.61 per square foot. Although asking rent has grown more rapidly in the Inland Empire relative to Los Angeles (2.2%) and Orange (2.0%) counties, they remain significantly more affordable, with Inland Empire companies enjoying a roughly 33% savings relative to Los Angeles and a roughly 28% savings over Orange County. Rising employment is driving demand for office space in the Inland Empire. Vacancy rates declined to 16.8% in the fourth quarter of 2018, down 0.2 percentage point from the fourth quarter of 2017. At the same time, the average asking rent for office space increased to an annual rate of $22.93 per square foot, up 1.9% from one year earlier. Businesses can gain significant cost savings in the Inland Empire relative to the pricier coastal communities. Moreover, asking rents grew more rapidly in these coastal markets over the past year, with asking rents increasing 3.2% in Los Angeles County and 4.0% in Orange County. Higher wages and continued gains in consumer spending are leading to higher demand for retail space in the Inland Empire. Retail vacancy rates remained at their lowest point since before the recession, declining to 9.2% in the fourth quarter of 2018, 0.4% decline from a year earlier. This decrease occurred as 379,000 square feet of new retail space came online over the last year. Strong demand drove the average asking rent for retail space to an annual rate of $22.99 per square foot in the fourth quarter of 2018, a 1.5% increase over the fourth quarter of 2017. Steady demand is also responsible for higher permitting activity for nonresidential buildings. Permitting for new nonresidential structures in 2018 was 6.3% higher than in 2017 and 52.3% higher than in 2016, reaching nearly $2.6 billion in total value. A significant portion of the permitting was for industrial space, with valuations totaling over $945 million in 2018, substantially higher than the same period in 2017 and 2016. Permitting activity for office space in the Inland Empire also increased over the last year, with $123.7 million in permits issued in 2018, roughly 49.6% higher than 2017. Although it is down from a year earlier, permitting activity for retail space remained solid, totaling $431 million in 2018. Director of Business Development Rick Smith at 858-997-1834 or rick.smith@ucr.edu or Deputy Director Sherif Hanna at 951.827.2792 or sherif.hanna@ucr.edu.